Adorable plush lamb from First and Main named Angelu. Wind it up and it plays "Brahm's Luillaby" while the head sways back and forth. 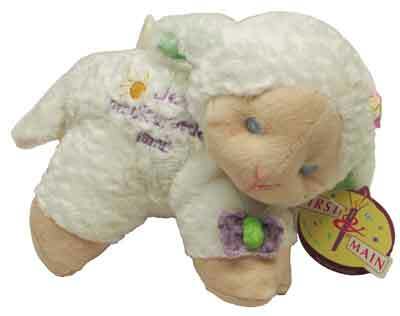 Embroidered features along with "Jesus' precious little lamb" embroidered along its side. 8" from head to back feet. We got a special deal on these and are passing along the savings to you! Great to add to your gift basket!